Inspired by Jimi Hendrix's unparalleled creative and musical influence, Experience Hendrix, L.L.C.--the company formed by the late guitarist's father, James "Al" Hendrix to oversee his legendary son's legacy--has continued that innovative spirit with its ongoing series of all-star tribute concerts held in honor of the late great musician. Originally conceived in the summer of 1995, the Hendrix family's first full sponsored tribute concert was born as the headlining attraction at Seattle's annual Bumbershoot Arts & Music Festival in September 1995. From its early beginnings as the Jimi Hendrix Electric Guitar Festival, the wheels were clearly in motion for this tribute concert concept to become something much bigger than just a single event. Over the coming 12+ years since the original Bumbershoot event, one additional Jimi Hendrix Electric Guitar Festival took place (1998), seven special one night only all-star tribute concerts in various cities throughout the United States and London, two installments of the nationwide traveling Jimi Hendrix Electric Guitar Competition, a four year running engagement of the traveling Jimi Hendrix Red House Tour; and most recently, two all-star tribute concert tours under the expanded banner of the Experience Hendrix Tour, which toured both the West Coast in 2004 with 3 dates in Seattle, Portland and San Francisco, plus an expanded tour of the East Coast in 2007 featuring 7 individual engagements in cities including Washington, DC and New York City among others. "The Experience Hendrix Tour is a unique opportunity for fans to experience the music and legacy of Jimi Hendrix in a way that CDs simply cannot offer," explains Janie Hendrix, President & CEO of Experience Hendrix, L.L.C. "We felt strongly that a live presentation of the music that Jimi Hendrix created and which inspired him would be an exciting and unique way of conveying his relevance to today's audiences." The opportunity to celebrate the legendary guitarist's music and continuing influence is welcomed by former Jimi Hendrix Experience bandmates Mitch Mitchell and Billy Cox. Bassist Billy Cox, who first befriended Hendrix when the two served in the US Army's 101st Airborne Division and later joined him in both the Band Of Gypsys and the Experience, is extremely pleased with the tour concept and the work the Hendrix family has completed since taking control in 1995. "Nobody cared about any of us musicians until Experience Hendrix came into being," states Cox. "We were never consulted about anything to do with the Jimi's music until the Hendrix family took over. I think Jimi would be proud of the way Janie Hendrix and the company have kept the music available to people around the world. "Mitch Mitchell strongly concurs with Cox: "Janie Hendrix has done her best to rectify the miserable, unjust situation which had gone on year after year. Janie cares about the music, she cares about the legacy and the fans. Until Experience Hendrix came on the scene there was no one in my opinion who cared about the quality of the music, about Jimi's name, and certainly about me. As for me, no one but Janie ever bothered and for that I am deeply grateful." Today, Jimi Hendrix's status as a cultural icon stands undiminished. His popularity and continuing influence on popular culture-more than three decades after his untimely death in 1970 is remarkable. Hendrix's appeal has been tapped repeatedly by Hollywood with inclusion in the soundtracks to popular films like Cars and Black Hawk Down, to hit TV series such as American Idol and Entourage, and to chart-topping videogame series Guitar Hero and Gran Turismo. 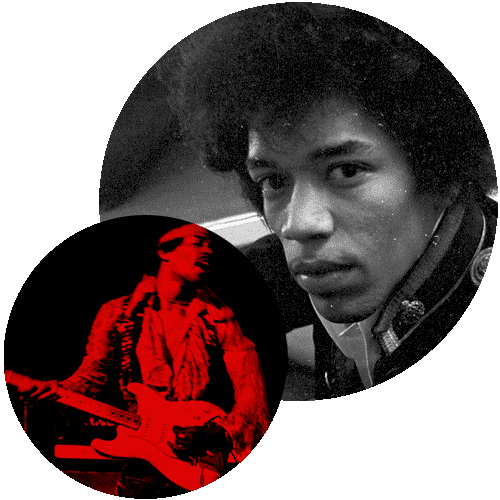 Meanwhile contemporary artists such as Outkast and Lenny Kravitz have not only been clearly influenced by Jimi's music, they have revived his fashion style, while genre-crossing artists such as Nigel Kennedy, one of Classical music's best selling artists, has interpreted Hendrix's songs in that realm. Regardless of the venue or musical genre, Jimi's music is routinely heard, live on stage, from a wide variety of touring musicians including the likes of Red Hot Chili Peppers, John Mayer, Los Lobos, Sting and Ben Harper. It's through this modern collection of cultural influences that the expanded Experience Hendrix Tour hones its direction, Not only does the touring production provide fans the opportunity to witness contemporary artists (Kenny Wayne Shepherd, Joe Satriani, Indigenous, Mike McCready) performing Jimi Hendrix's unforgetable music; but also the chance to experience several artists that helped to influence Jimi's own music vision (Buddy Guy, Hubert Sumlin, etc.) and fellow artists that were Jimi's close associates and either performed with or hung with Jimi in the 60s (Mitch Mitchell, Billy Cox, Buddy Miles, Carlos Santana, Robbie Krieger, etc.). It's this fusion of classic Jimi Hendrix music combined with the unique pairing of practicing musicians that makes the Experience Hendrix Tour such an uncommon musical treat dishing up night after night of unforgettable music and exciting stage performances, all in tribute to the musical legacy of the world's greatest guitarist—Jimi Hendrix.